What comes to your mind when you read the word “recess”? Many will recall elementary school days of spending time on a playground with your friends running, jumping, exploring, etc. It was the best part of the day! SAFETY: A moving baby who puts everything into his mouth needs to be watched all the time because he can quickly swallow small objects or creep into unsafe places. Babies are not able to understand about danger. Lock away unsafe objects or put them high out of reach. Many experts advise to use the TP Rule: if an object can fit through the hole in a toilet paper tube, then it is too small for a child 3 and under to play with. If there are older siblings in the home, please teach this to them as well so they can be an active participant in determining what toys can be out when baby is playing. PLEASE ENSURE THE SAFETY OF YOUR BABY by childproofing! Get down on the floor, crawl around, and see what your little explorer could find! Social: Time for play dates! Start early – this is as much for you as it is for your baby! People are much more interesting than things and babies love to see other little people that look like they do! You and baby will also create lasting friendships. Stranger/Separation Anxieties: Expanding baby’s social circle is important but be aware of his sensitivity when around strangers and when separating from mom (stranger anxiety and separation anxiety). If you do have to leave, make sure you still say good bye and explain that you will be back. Simple: Babies don’t need fancy toys! They can be happy playing with a set of measuring cups, exploring plastic bowls or a spoon, etc. The main point to remember is offering varying sizes, shapes, colors and textures. Remember, baby is not impressed by labels or price tags! Sun, Sand, Snow: It’s time to get outdoors! 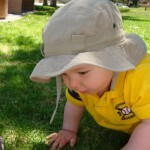 Baby is now old enough to be outside with baby safe sunscreen so spend time enjoying it. Watch the trees moving in the wind and try to find birds, flowers, doggies, and other people. Talk about you are finding as you explore the environment! Baby loves to hear the sound of your voice and the more you speak in a happy, sing-song voice, the more your baby will listen, engage, and learn. Try and make some of the sounds that you hear. 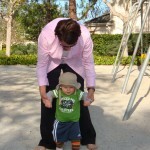 This is also a great time for more walks in the stroller or in the carrier. Don’t forget other fun activities like crawling on the grass, putting feet in the sand, playing with bubbles, to name a few. Take time to truly marvel this amazing stage of development . . . it will be gone before you know it! Once established that your newborn baby (0-2months) is in an active-alert, ready to learn, ready to play state, what on earth are you supposed to do with her!?!?! In a one word answer, LOVE her! Touch her, hold and hug her, cuddle with her, sing to her, whisper sweet nothings, give LOTS of kisses all over. But…let’s also be realistic. Newborn babies are not awake that often, and when they are they are usually eating, pooping, burping, spitting up, being changed and/or bathed, changed again, and changed again. Is there time for all this LOVE? YES! Because the love happens during all the awake duties. Don’t think about it being extra, think of it as being a part of each task. Love is a journey, not a destination! So, slow down, don’t rush through all the tasks, take time to observe and interact with your baby during all of it. Changing at our house routinely takes 15-30 minutes because of all the play on the table. Before you know it, playtime is over and it’s nap time again! And, please, though we all know that moms and dads are super-heros, try to take a nap when your baby sleeps. These first several weeks are often about survival, especially when up many times during the night. We also know if this isn’t possible…but give yourself permission and try :-). Always good to shoot for the stars, and have someone ELSE clean the house, do laundry and make dinner too :-). – Sing nursery rhyme songs or recite rhyming poems (from memory, refresh, or learn new ones). – Talk about what you are doing at that moment in time, or tell a story about what happened during day or the plans for rest of day. Get VERY detailed. It will take a long time! – Observe your baby’s facial expressions and copy them. Especially the mouth/lips/tongue. 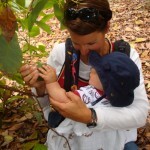 You will be amazed at what your baby can “say” to you through her mouth and you will start to learn so much about her. – Read books and show pictures, black and white work best, but you can throw in some red too. Start with simple pictures and slowly get more detailed. – Move slowly as you work around baby so she has a chance to see and track you from side to side with her eyes. – Tummy time!! Near and dear to our hearts at Move Play Grow. Try chest to chest with you propped up closer to vertical than horizontal at this age. OR get down on floor and lay next to your baby about 10 inches away so she can see you best. – Wear your baby and go for a walk to get out. – Be quiet and still. Being awake, babies are taking in even the most mundane things that we take for granted. 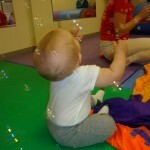 No need to over stimulate by shaking rattles and toys in their faces, moving and bouncing all the time. Allow some “down” time too. Most importantly, get to know your baby: observe, learn, internalize, journal (write stuff down…you think you will remember everything, but you won’t), and love her. There is NO ONE else in the world like your baby and definitely NOTHING like the unique relationship you have with her. Cherish it! The Most Wonderful Time of the Year? Strategies to Help Keep it That Way! Routine: DO try and stick with your routine to decrease stress levels of the family! When possible, try keeping normal nap, bed, and eating times to avoid increased irritability. If our babies and kiddos know that their routine “travels” too, they are less likely to be anxious or stressed by not knowing what is coming next. Bringing a comfort item from home can also help with the differences. Remind/Rehearse: For children preschool age and older, as the holidays approach, routines change at home but also significantly at school as well. It is important to compensate by providing greater predictability and structure at home. Some children may benefit from visual or verbal prompts to remind them of the different events throughout the day that stray from the “norm.” Consider making a holiday calendar. Create a list or insert pictures of planned activities that are outside the regular routine. Respect: DO show respect for your child’s age and stage. At four months, I know that baby is more alert and becoming more attached to mama. I want to be respectful of just how overwhelming new faces, sounds, smells, etc. may be to this new little life. I also respect that my preschooler may still be a bit shy around family he has not seen in some time. Talk to your child about good times with each relative. Then, as you introduce them, you can remind them of the pleasant story and your child may feel like they know them. Pictures are also helpful! If a child is sensitive to touch, perhaps offer for him to give a “high five” instead of a hug! Realize: Do realize each child’s limits and build in some down/quiet time for the babies and younger kiddos! Some quiet time with mom or dad, reading, talking or resting, often allows the child to reset. When possible, try to schedule only one or two outings per day as this is often plenty for young kids. Remember the malls and stores are now more crowded with people, “things,” decorations, etc. This bombardment can overwhelm even the strongest of sensory systems! Reward Yourself: Mamas are often the glue that keep the family together and running smoothly. We can feel a tremendous emotional fatigue during the holidays -which means fewer emotional resources with which to manage our kids. If we are emotionally fatigued and anxious, we are not available to be there for our kids emotionally. Try not to overload yourself with obligations or extra stressors . . . the holidays in themselves bring plenty of extra! Sometimes with extra hands around you can get some extra “YOU” time. Reward yourself mama, you deserve it! Our childrens’ behavior is highly meaningful and they are communicating something with their actions. It is our job to watch, listen and interpret the message. I am hoping to be more aware of that this holiday season. The content on this website is based on Wendi’s personal and professional experience and general research. It is not meant for individual medical diagnosis or treatment. If you are concerned about your child, please consult with your primary physician and/or therapist. Move Play Grow helps parents get to know and understand their babies and children as whole beings, moving and playing and growing together. MovePlayGrow © 2018. All Rights Reserved.